Kiptopeke State Park: Take a trip to Kiptopeke, and you’ll have the chance to witness the migration of peregrine falcons, American Kestrels, warblers, herons, shorebirds, and thrushes. What a beautiful mix of birds! There are just over 5 miles of hiking and biking trails in this park, leaving you with plenty of fun opportunities for bird watching. Kings Creek Marina: Whether you’re riding along in a rented golf cart or taking a kayak out onto the water, you’re sure to catch a glimpse of shorebirds and clapper rails. Be sure to take advantage of the nature trails for the best bird views! 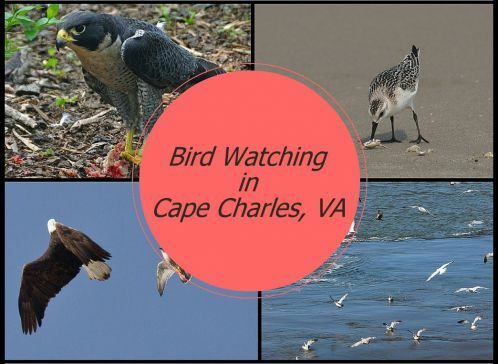 Eastern Shore of Virginia National Wildlife Refuge: This beautiful Cape Charles wildlife refuse just so happens to be “one of the premier birding and wildlife sites on the Eastern Shore” (DGIF). There are over 300 species of birds on the refuge’s list, so there’s a very good chance that you’ll be able to observe warblers, hawks, peregrine falcons, and more.